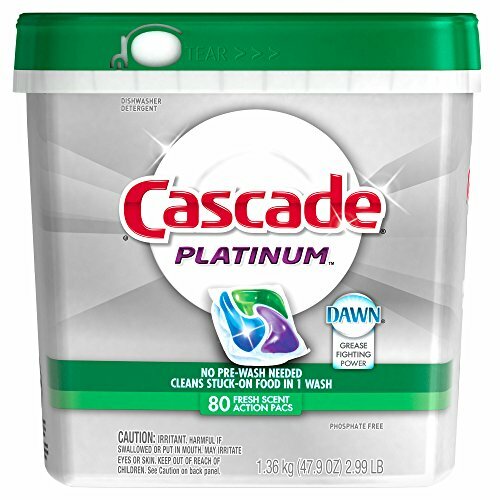 Cascade Platinum ActionPacs clean stuck-on food in one wash, with no pre-wash needed. Plus, with 3X more film-fighting power, they're our best clean for sparkling silverware and dishwasher. Premium tough food cleaning powers away stuck-on foods, while built-in rinse aid action and the grease-fighting power of Dawn make your dishes dazzle. Plus, it's formulated to help prevent hard-water filming-keeping your machine looking fresh and clean. Simply pop in an ActionPac and reveal a Platinum sparkle.